The Banshees stood out from the rest of the punk bands in their style, their attitude, and the mysterious, somewhat discordant, dark noise that they made. There was an air of danger about them, depth, mysteriousness, and Siouxsie herself was stunning, a force of nature, a revelation. I first saw the Banshees supporting Johnny Thunders and the Heartbreakers at Middlesbrough Town Hall on 13th October 1977. Marie and I turned up early specifically to see Siouxsie. The venue was far from full, and this was a raw, ramshackle, Banshees; still feeling their way and learning their craft. But you could see that there was something different and special about them. The uniqueness of their music, Siouxsie’s style and arrogance, their image, all shone through the amateurishness. Siouxise was full of edge that night, fearless, and obviously out to shock. She was dressed in a see-through net top, a leather cap and looked just great. She commanded the stage with crazy dancing and goose stepping. The band were very young at the time and looked it; this was the first and best line-up of the Banshees; with Sioux on vocals, Severin on bass, Kenny Morris on drums, and John McKay on guitar, before they released their first landmark album “The Scream”. I can’t be certain what they played that night, but remember being impressed. I am pretty sure they played Metal Postcard, Carcass, T Rex’s 20th Century Boy (Souxsie announced the song “From one Carcass to Another” which I remember clearly as I thought it pretty bad taste at the time, as Bolan had died just a few weeks before), Love in a Void, The Lords Prayer, and Helter Skelter. For me they were the best band of the night and I went on to see them many more times over the next few years. The next time I saw them was at a packed Durham University Dunelm Ballroom on 15th April 1978. By now the Banshees were a proper band, a major force. 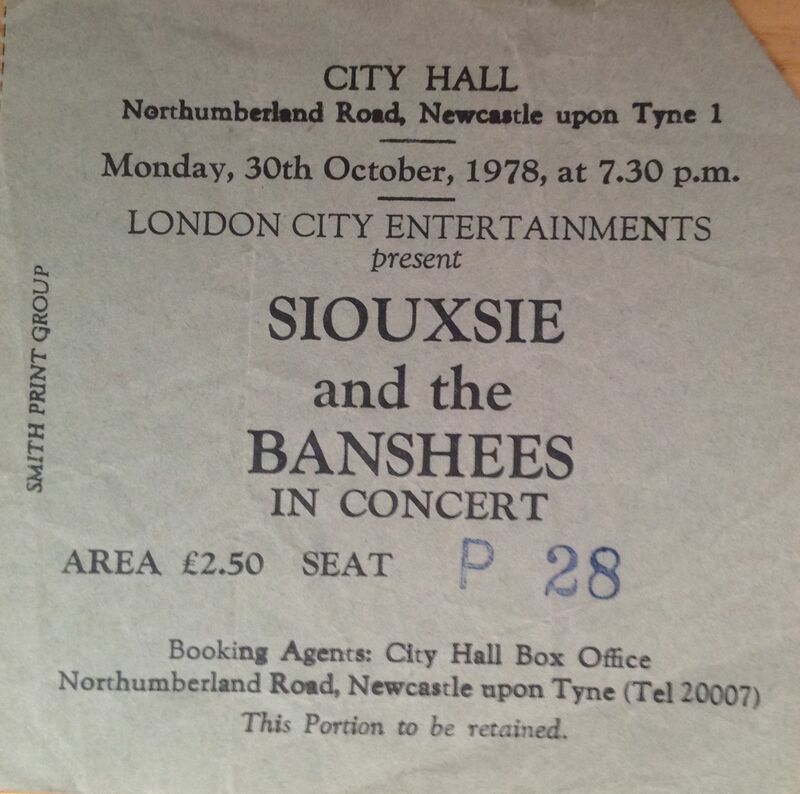 The venue was packed, the crowd crazy, the Banshees loud and intense and Siouxsie pure electric magic. The evening was spoilt by trouble and fights. There was a scary edginess in the air. As we left the venue we faced a massive line of skinheads blocking the ramp leading out to the street. “We hate punks!”…mass brawls….the police soon arrived. We ran to the car and made a swift, and lucky, escape. The Banshees first single Hong Kong Garden was released in August 1978, they were soon in the charts, and then went out on a full UK tour of major concert halls. 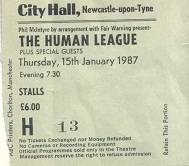 I saw them at Newcastle City Hall on 30th October 1978. Support was Spizz Oil (did Spizz really wear a helmet and keep hitting himself on the head, or did I dream that? ), and the original Human League. The concert was sold out, and the music and the performance were joyous, swirling, challenging and totally engaging. From the first crashing, discordant opening bars of Helter Skelter, through the majestic pop of Hong Kong Garden, to the closing song The Lord’s Prayer, Siouxsie had us all totally captivated. Thinking of the punk bands that I saw live at the time; The Pistols were raw, powerful, important and vital; The Clash were rocky, political, fast, furious and “meant it”, The Jam were sharp, smart, and poppy; and The Damned were simply crazy, madcap, laugh. But the Banshees were different, daring, challenging, uncompromising, and produced sounds that came from somewhere dark, adventurous, rhythmic and yet uplifting. As you might have gathered; I was a big fan. More about the Banshees tomorrow.